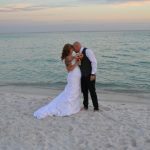 Here at Beach Bride Weddings LLC we try to make your wedding day the best it can and there are some items we permit you to bring to your ceremony. Listed below are the items you can bring to add ambiance to your wedding. Bouquets for brides and bridesmaids, boutonnieres for grooms and groomsmen, corsages for wedding party, halos for bridesmaids, military mementos, pictures of loved ones who have passed away. If you are getting an arch package with us you can bring fresh rose petals. If you are unsure of what you can bring please contact us and tell us what you want to bring. We will take in consideration reasonable requests. We are here to help you. Contact us so we can advise you. Wedding arches, bamboo arches or arbors, fabric for draping, floral decorations for decorating , tiki torches, aisle decorations, mason jars, shepherd’s hooks, synthetic rose petals. You cannot make designs in the sand with rose petals. No glass is permitted on the beach. Fabric rose petals are considered litter and you will be responsible for a $500 fine by the authorities. Our goal is to leave only footprints. If you are uncertain about which items are not permitted contact us and we will assist you. When you start your wedding planning keep your notes organized. To keep everything at your fingertips we recommend putting it in your cell phone. Have certain phone numbers in groups so you can access them with one touch. This website is full of useful information so read every page to help you make the best decisions for you and your loved ones. While you are here make sure to keep your doors locked. That includes your accommodations and your vehicle as well. The area is very safe but practice the same safety measures you would at home.